When I was a schoolboy in the early 1950s I remember the excitement of the new shops being built, initially where the photographer was standing was a road known as Queensway, there were only shops along the right hand side of this photograph, the building at the bottom was yet to be built, if you could have stood in the same spot in 1953 you would be able to see along the length of Roseberry Road as far as Wolviston Road/ Billingham Bypass, if you were to walk to the fence alongside the bypass and look across the open land you would see the “Russian’s” farm on Sandy Lane, the next village would be Thorpe Thewles, amazingly if you stood in the same spot now you would see the “Russians” farm is no more and the land is a golf course but there are still open fields, woodland and meadows as far as Thorpe, this area was my playground as I was growing up. Like David Isley, I can remember this area before any of the town centre was built. I lived in Hambleton Square, off Roseberry Road. At the time (early 1950’s), Roseberry Road was a dead end just east of Sidlaw Road with no connection to Pentland Avenue and only open fields beyond. Once the initial road infrastructure was installed, the single row of Queensway shops soon followed with Woolworths, Mac Fisheries, Findlays etc. In 1960, I recall seeing a large model on display showing how the town centre would look when development was completed in 1970. I remember the year because I was 15yo at the time and thinking that 1970 when I would be 25 was a lifetime away! 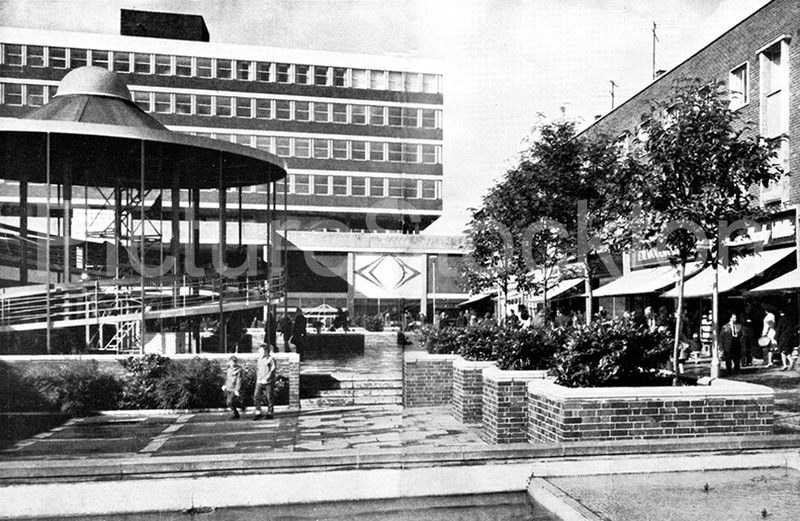 As has been said, the town centre was the catalyst for the development of Billingham north towards the Wolviston – Newton Bewley Road. In 1962, my parents bought the first house in an initial development of 10 homes on Wolviston Back Lane running between Cowpen Bewley and Wolviston. On the few occasions I revisit Billingham, I am amazed how big this development now is. Wolviston Back Lane still exists in places but is no longer a country lane but a hardly noticeable road lost in an enormous housing estate. I remember this before it was all built up and going shopping with my mam to Woolworths. The “Russian” in the comment was a Ukrainian called Skripka who was a market gardener who grew vegetables such as cabbage, cauliflower and sprouts. Much of his produce was sold to Maurice Brackenborough of Wolviston who supplied the villagers, local shops and the I.C.I canteens with his produce. He is remembered by street names for houses built on land he worked. I remember those days well. We lived at the bottom end of Roseberry Road, and I can remember the shops being built. This was before the construction of the large council estates, which expanded Billingham so much during the 1950’s. I could look out of my back bedroom window and see the cottages and houses of Greatham. The land West of the old A19, was all open fields. Sandy Lane, “Billy” beck, North of the railway embankment, were regular play areas. We would go potato picking at the Russians farm on Sandy Lane, and sledging on the steep fields, where the golf course is now. The town centre was the catalyst for the expansion of Billingham North of the railway, and was a source of pride to Billingham folk for many years, but was allowed to decline. An excellent picture. Very positive. This must have been taken by a photographer that wanted to capture that moment in time when we were all excited about our wonderful Town Centre. I now live in Telford. This place made a lot of mistakes. Remember it well especially the Russians Farm. I used to go potato picking there. The Russian would drive along with his tractor digging up the potatoes then, we lads would rush forward pick up the potatoes in a bucket rush back and put them in sacks. If we were too slow, the Russian would throw potatoes at us. It was grueling work.